What’s great about these low carb cheesecake fat bombs is that they are super easy to make and flat-out delicious. If you’ve been hesitant to try fat bombs because you’re afraid you won’t like the taste, fear not because if you like cheesecake, you’re going to love this recipe. 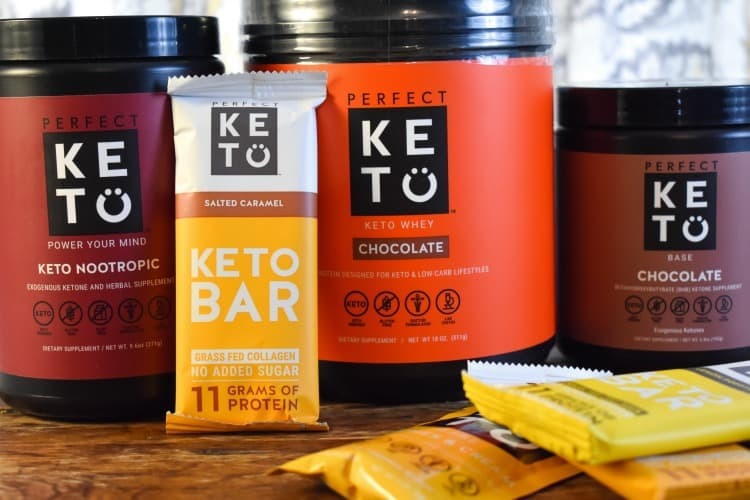 Although I’m a huge fan of using fat bombs while doing a keto diet since they are an effective way to raise ketones, what I don’t like is for the taste of coconut oil to be overpowering. What sets my keto cheesecake fat bombs from most other recipes, is that it doesn’t taste like coconut oil but rather like a bite-sized portion of cheesecake. Plus, these are basically 3 ingredient fat bombs. Have a higher amount of ketones and indulge in a cheesecake treat, what’s not to love? If you love recipes that feature cream cheese, do check out our collection of Keto Cream Cheese Recipes for more delicious keto-friendly treats. 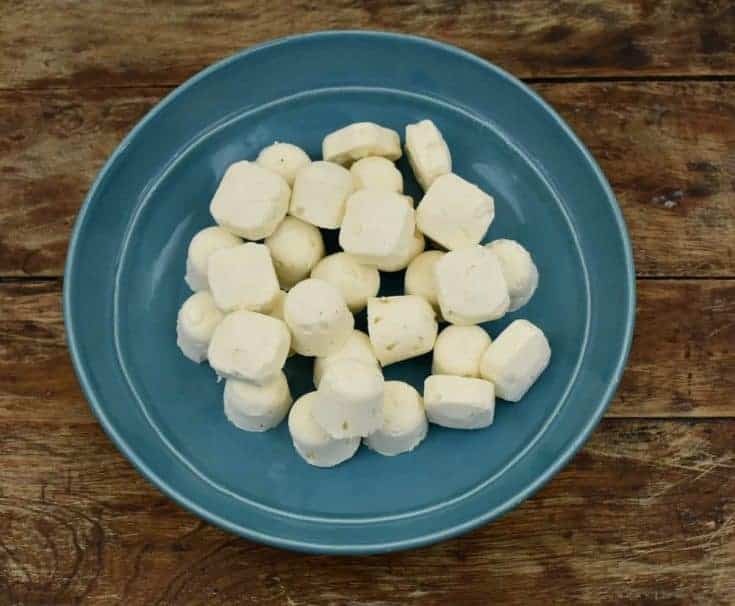 These cream cheese fat bombs are easy, no-bake and take only minutes to whip up. So even if you are not fluent in keto baking, you can enjoy these delicious treats. I make it a point to keep a batch of these in my freezer so that I can access a snack when I need a little pick me up. In case you don’t know, fat bombs can be an effective tool in raising your ketone levels. When your body burns fat for fuel instead of glucose, it’s important to have enough dietary fat in your diet. If you don’t have enough fat to fuel your metabolism you can experience a stall or decrease in ketone levels. 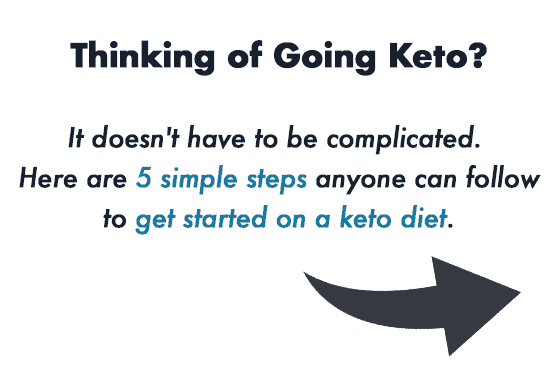 Being in ketosis is the goal when doing a ketogenic diet, because when your ketone levels are elevated your appetite drastically reduces. A recipe like these cheesecake keto fat bombs can not only reduce your appetite but keep sugar cravings to a minimum. Adding fats in the form of fat bombs makes for a good snack because it keeps you satiated. But they are meant to be enjoyed in moderation. Just one or two fat bombs is enough to keep you fully satisfied. When I make my fat bombs I keep them stored in the freezer. My fat bomb recipes all include coconut oil and when coconut oil is allowed to come to room temperature it melts. So keeping them in the freezer just makes sense. But I also like that fat bombs are just a small treat. I will usually have a keto cheesecake fat bomb as a quick snack before a workout or in place of dessert. The best way I can describe a fat bomb is to think of them as a bite-sized snack or treat that is high in fat and also low in carbs. Most fat bomb recipes have some sort of variation of coconut oil, cream cheese, and butter. When doing a ketogenic diet fat bombs can be a delicious way to meet the diet’s fat macro requirements. While simultaneously boost your body into making more ketones naturally. Why should you even consider adding cheesecake fat bombs to your diet? Well, because on a keto diet you use fat as fuel instead of glucose, sugar. And by adding more healthy fats into your diet you keep your appetite in check. Plus, fat bombs can give you a boost of energy and give your brain the healthy fats it craves. If you’re doing a low carb keto diet, chances are you probably already understand that your main source of energy should come from fat. But if you are new to this lifestyle adding fat to your diet in the form of fat bombs may seem odd to you. 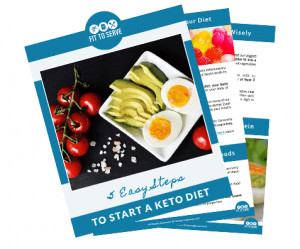 However, when doing a keto diet the goal is to reduce your carbs drastically and raise your healthy fat intake so that you enter ketosis and burn fat for fuel. It’s why these cheesecake fat bombs can be a great addition to the lifestyle. A true Ketogenic diet’s macros look something like this, 75% fat 20% protein and 5% carbs. But let’s face it, adding high-fat snacks can prove to be a little tricky especially if you’ve shunned fat for years. The best way I’ve found to add healthy fats to my diet has been using fat bombs. It ensures my sugar cravings stay controlled and raises my ketones. My Keto no-bake cheesecake fat bombs come especially handy when you just need a little something to tide you over till your next meal. Wondering how a tasty little cheesecake treat can somehow reduce hunger? It’s all due to the high level of healthy fats. Use the highest level of ingredients you can afford when making these cream cheese fat bombs. This way you ensure you are getting fat-soluble vitamins, and a better omega-3 to omega-6 ratio. I suggest using grass-fed butter and organic coconut oil. When making your keto no-bake cheesecake fat bombs make sure all your ingredients are at room temperature, this will allow for easy mixing. 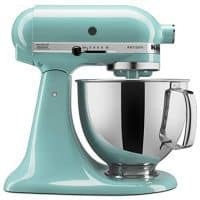 I encourage you to use an electric mixer to combine all the ingredients so that there are no lumps in your fat bombs and so that the fats are fully incorporated. The quality of fat you use is important, especially when it comes to fat bombs. I recommend you use grass-fed butter and organic refined coconut oil for optimal benefits. Although I don’t mind the flavor of coconut oil, I opted for refined so that the flavor doesn’t overpower the keto cheesecake fat bomb recipe. You can use any mold shape to create these fat bombs but they should not be over an inch, the goal is to have a bite-sized keto cheesecake treat. I prefer using silicone molds because they make un-molding easier. 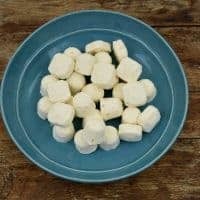 I have several sugar-substitutes you can use when making these keto cheesecake fat bombs. 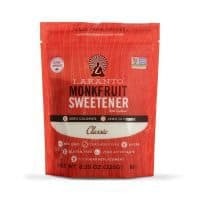 If you’re looking for a sweetener that reminds you of real sugar I’d recommend you try Lakanto Monk Fruit. The texture of this all-natural sweetener is spot on plus it barely has an aftertaste. I’m also partial to Swerve which is an erythritol blend. You could also use the stevia and erythritol-based brand Pyure here with good results. Lastly, if you can’t easily find a more natural sugar substitute you can also use Splenda with great success. I just don’t recommend any liquid sweeteners because I find they tend to crystallize when frozen. If you want to include fat bombs in your diet you need to also reduce your carbohydrate intake. Adding more dietary fat to a diet that is high in carbs can spell disaster. Why? Because high fat and high carbs can never co-exist. It’s why junk food is so detrimental to our health. You see, it’s the carbs that make your body store the fat. Dietary fat alone is not the culprit but when combined you will not gain the benefits of burning fat for fuel. Instead, you will find yourself packing on some extra unwanted pounds. So do yourself a favor and reduce your carbs before thinking of adding cheesecake fat bombs to your diet. I’ve created several fat-bomb recipes for you that are easy to whip together. I hope you will take a look at these too. The idea of adding more fat and therefore more calories to your diet may seem counterintuitive if you are trying to lose weight. But as long as you keep your carb intake low, dietary fat is not an issue. There are two camps when it comes to counting calories in a ketogenic diet. Some people track every macro and others simply let their hunger guide them. I recommend you test what works best for you. The truth is, you need to see how your body reacts since everyone is different. Randy and I don’t obsess over our macros but this is because we are now in maintenance mode. 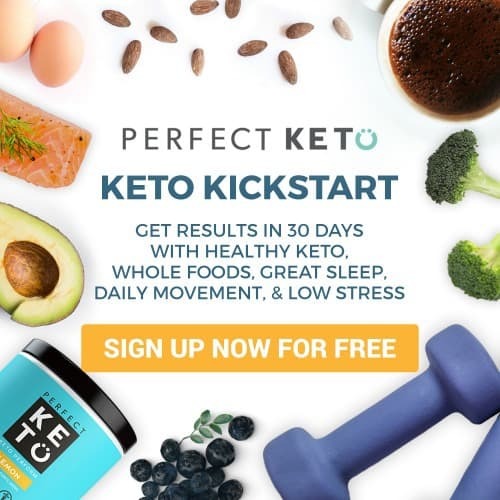 If you’re just starting a keto diet it would probably benefit you to track your macros consistently. Eventually, it becomes second nature and you kinda keep a running count in your head. At least this is what’s worked for us. A recipe for keto cheesecake fat bombs. These fat bombs include cream cheese, grass-fed butter, coconut oil for a healthy treat that is packed with flavor and nutrients. Using an electric mixer beat the room temperature cream cheese and butter until light and fluffy. Next add sugar substitute, vanilla and coconut oil. Using a piping bag pipe into small cupcake liners or silicon mold. Place in freezer for an hour to firm up. Pop your cheesecake fat bombs and store in a container in your freezer. Note that these fat bombs will melt at room temperature. Makes 30 1 inch cheesecake fat bombs. You can add a berry of choice to the mold for another variation of this recipe. Store your fat bombs in the freezer in a freezer tight container for up to 3 months. What type of substitute sugar do you like? I prefer to use swerve, although it's a bit pricy I also use a high quality stevia that is not bitter from the NOW brand ? Reblogged this on Dot to Trot and commented: I've looked for ways to add more fat to my diet (I eat low carb/high fat) and have wanted to try a "fat bomb" for a while. 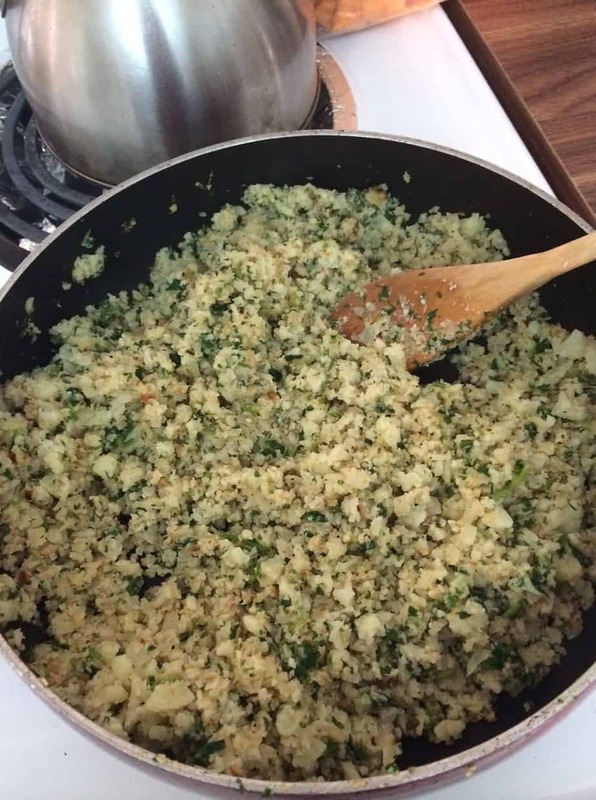 This recipe from Fit To Serve looks simple to make and I have all the ingredients at home. This weekend I plan to make 2 batches -- one as is and the 2nd using either maple, lemon or peppermint extract. Yum. Thank you for rebloging it really super easy, and best of all it work with weight stalls ?enjoy! Sounds delicious, want to try it. I have a question though as I've yet to find a purely natural sugar substitute other than honey or maple syrup which don't work in some things as they tend to be more runny. Synthetic substitutes are all highly dangerous to health ( safer using sugar!). I haven't heard of the one you mentioned is that also synthetically made? I like to use swerve or stevia. You can make it more Paleo by using a little honey or maple syrup but it will up the carb count. Because this is frozen either will work just fine, I have used liquid stevia .Let me know how it turns out. No here in the U S it's very common. It's a leaf ? I have heard of fat bombs for a while. I joined a low carb high fat group on facebook 18 months ago when I first started to try cutting carbs. I never tried the fat bombs though, but thinking this might be a good thing for me to have on hand. I have a real problem with hunger and maybe this would help curb that. Reblogged this on Low Carb Living Today. Hi Ana, thanks for the reblog! ? Well, I'm home now, time to get back on track. 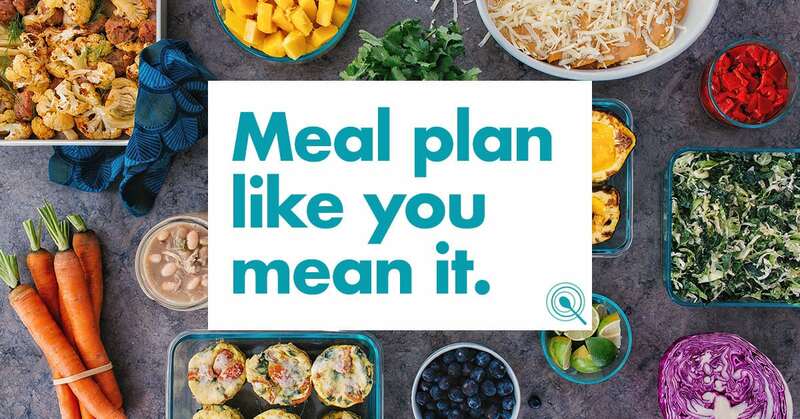 I'm reading your info now and i'll be making changes to go even lower carb. Sounds good Ana, let me know if you have any questions. Here to cheer you on. ? Reblogged this on The Baking Nurse and commented: This recipe is one on my 'to make' list! Maybe I would add a little lemon to get that extra bit of character, but I am sure making these! Thanks for the reblog several people have added that touch of lemon and they love the results. In my book recipes are meant to be tweaked? enjoy! What are the macros in each serving? Hi Melanie, sorry I haven't calculated them. If you have an app and get a chance to do so it would be wonderful. Have a lovely week. I added up the ingredients on spark people, I had to add surkin melis sugar substitute and it didn't have an option of selecting the carbs were sugar alcohols. It came out to 1712 calories for the batch, 42g carbs, 184g fat, 18g protein I used 8 cupcake liners although I may cut these in 1/2s or. 1/3rds So for each that woul be 214 calories, 5.25 carbs, 23g fat, 2.25g protein So for 1/2 the size I made its 107 cal, 2.625g carbs, 11.5g fat, 1.125g protein. I also blended this in a Vitamix because it's easier for me to clean and pour into containers. Hi Jennifer, thanks for stopping by and sharing. Have a great week!